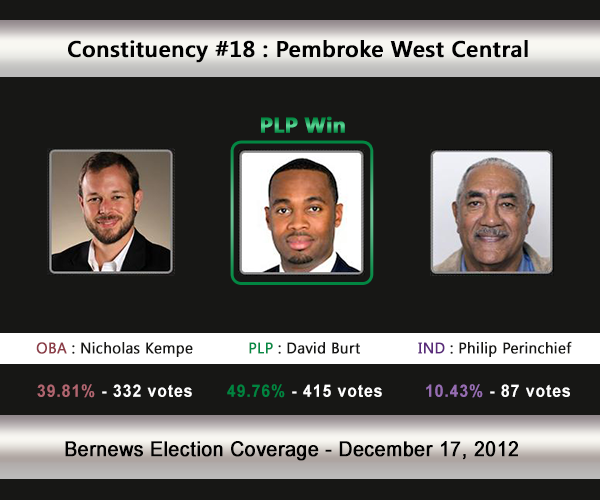 [UPDATE Dec 17: Election Results] David Burt [PLP] has defeated Nicholas Kempe [OBA] and Phil Perinchief [IND] in C#18 Pembroke West Central. Mr Burt, 32, becomes one of the youngest MPs. The incumbent was Neletha Butterfield [PLP]. This area will see two of the island’s younger politicians both contest their first General Election, with the PLP’s David Burt [age 32] matching up against the OBA’s Nicholas Kempe [age 29]. It will also see a veteran political figure standing as an Independent, with Phil Perinchief throwing his hat in the ring. The incumbent is the PLP’s Neletha Butterfield who won 69.62% of the vote vs the UBP’s Mariyln Steede [25.15%] & IND Roger Russell [5.22%] in the 2007 General Election. In the 2003 General Election, Ms Butterfield won with 63.75% of the vote against Erwin Adderley [UBP] who received 29.88% and Stuart Hayward [Independent] who received 6.38%. Phil Perinchief will be running as an Independent in this area. 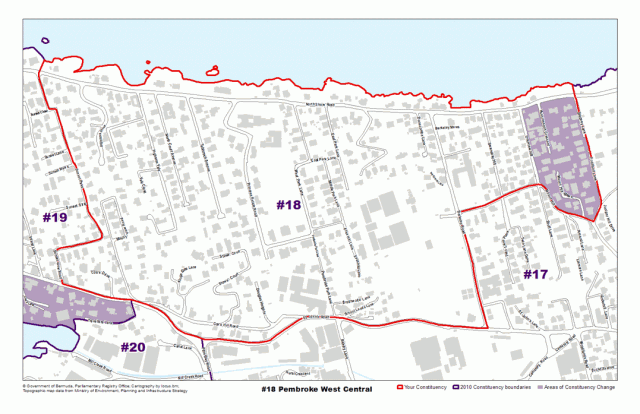 Areas Pembroke Central compromises of, or is located by, include St. John’s Road, Sunset View Road, North Shore Road, Stepney Lane, Overview Hill, Mount Hill, and Berkeley Road. Edward David Burt was appointed a Member of the Senate and Junior Minster for Finance and Environment Planning and Infrastructure Strategy in November 2010. In addition to his responsibilities in the Senate, he serves as Chief of Staff to the Hon. Premier Paula Cox. Since joining the Progressive Labour Party, he has held various positions within the party, including National Party Chairman from 2006 – 2009. David graduated from Florida Air Academy in Melbourne, Florida in 1996. He went on to attend The George Washington University in Washington, D.C., where he earned his Bachelor of Business Administration with a double major in Finance and Information Systems in 2001. He was awarded The George Washington University Presidential Administrative Fellowship and received his Master of Science in Information Systems Development in 2003. In 2004, David started GMD Consulting Limited, an IT and small business consulting firm focusing on project management and has served as President since its founding. In 2009, he was certified as a Project Management Professional. His proudest achievement in business is having mentored 3 Bermudians to attain their project management certifications. David has served on the Tourism Board, National Training Board, and as a Director of the Bermuda Chamber of Commerce. He is currently a Director of the Bermuda Economic Development Corporation. David believes strongly in empowering Bermudians to seize the opportunities of the future. This requires lifelong investment in our people by providing continuing education and training. David is a strong proponent of Bermudians getting involved in their communities. He is a member of Alpha Phi Alpha Fraternity, Incorporated, the Young Men’s Social Club, and the Devonshire Recreation Club. He is a lifelong resident of Pembroke and is committed to becoming a familiar sight in the streets and homes of Pembroke West Central. David is the son of Gerald and Merlin Burt and he is married to Kristin Chambliss. Nicholas Kempe is the Vice President of local trucking and import company, Bermuda Forwarders. He has been working for Bermuda Forwarders since he was a boy in school, spending his summers learning the ropes. Although he grew up in Pembroke and attended Saltus Grammar School, he finished his secondary education in Spain, and went to university in Spain and Italy, where he earned degrees in Economics and Business Administration. Before he left Spain, he worked at a 5-Star hotel in Cordoba. Back in Bermuda, he made his home on Tablerock Avenue, near West Pembroke Primary, where he now lives with his wife and his sister. It was his education in economics that spurred him to become involved in politics. Bermuda’s debt level, he believes, is not sustainable – “Bermuda is in deep trouble unless we make a change very soon,” he says. When Nicholas is not working he enjoys spending time helping individuals in need of financial assistance and advice. He is an avid cook and is passionate about the energy savings and health benefits of eating locally grown vegetables and supporting local farmers. Phil Perinchief, lawyer, former Attorney General and Minister of Justice, has been a ‘voice for the voiceless’ and a ‘defender of the defenceless’ for over 40 years. He will be an independent, fierce and fearless advocate, free of party lines, party whips and party hacks, for ALL of the constituents of Constituency 18 should these constituents graciously ELECT him to Parliament on December 17th, 2012. Phil will stand on principles of honesty, forthrightness and integrity, and represent his constituents’ issues and concerns no matter what the consequences. Having lived in Constituency 18 for most of his life, Phil often meets and greets people he went to school – or ‘nicked’ marbles – with at West Pembroke and Berkeley. People like Humbug Holder, Ball Bags Woodley, Bop and Bredd Wellman, and Phil’s namesake, Philip John Dyer. Phil still visits Lady’s Chamber, Deep Bay, Admiralty House, Mount Hill, Ducking Stool and some of his ‘ace-boys’ hanging out at Mills Creek. Phil’s a ‘Point Boy’, a ‘home-boy’ and a ‘son of the soil’. Phil’s brothers and sisters, nephews and nieces still live in ‘Pembroke Park’. Like other Independent candidates Jonathan Starling and Erwin Adderly, Phil is passionate about social justice, gender and racial equality, participatory democracy, a healthy, safe and green society. Phil is also passionately against, and intolerant of, unjustified and unjustifiable discrimination in all of its forms – issues of age discrimination, racism and sexual orientation – are at the very top of his LIST. He will draft and lay the Bill upon the floor of the HOUSE if he has to, and then VOTE FOR and appropriate EQUALITY ACT. Phil has the energy, the experience, the passion, the vision and the expertise to deliver that LIST efficiently and quickly – from ‘Mount Hill’ to Parliament Hill and on to ‘Government Gate’ Hill, without fear or favour. Phil will fight for ALL of his constituents in #18 regardless of their political affiliation or persuasions, their race, colour or class.